Along with the amazing sea life you might encounter around the Kitsap Peninsula, the Salish Sea and beyond, I also want to periodically highlight some beaches that host our saltwater bounty. The area of South Kitsap from the Harper pier, south into a pocket estuary is a great place to watch birds, dive, reflect on history and our shoreline fingerprint, launch a boat, and explore the beach. The area uncovered by a low tide is a real hodgepodge of public and private ownership, but the boat launch and fishing pier are readily identifiable public access points. Harper has a history well worth noting. 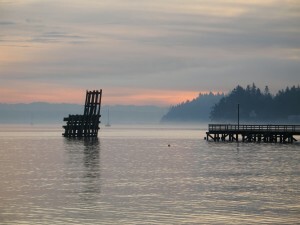 The fishing pier stands were the ferry system linked Kitsap to Vashon and West Seattle until the early 1960’s. 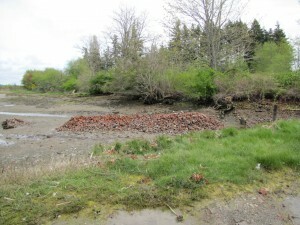 Until their 2009 removal, a remnant of the ferry dock (a cluster of deteriorating creosote pilings called a dolphin) could be seen at the end of the pier. The Harper pier is frequented by divers and anglers alike. For divers, there are even a couple wrecked boats to explore beyond the pier. The sport plumose anemones, kelp crabs, barnacles and other piling fare to enjoy. Divers also find abundant lures, lines, bottles and mobile phones lost by the piers other regular users. It’s also a great place to see birds and get a great view of the Central Puget Sound. A fascinating history lies on the beach near the boat launch, and just under the surface. The Harper Clay Products Company started making bricks from nearby clay in the late 1800’s (click here for some great old photos and maps). The good bricks can still be seen in Pioneer Square buildings in Seattle and in the Governor’s Mansion in Olympia. 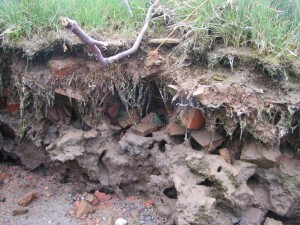 The discarded bricks, however, are abundant near the boat launch as one of the “brick dump” areas used by the factory. The bricks wind up supporting barnacles, rockweed and some other animals that live on hard surfaces, though in the areas where they’re piled deeply, they don’t do any favors for the mudflat organisms that would have been there in their absence. A rich pocket estuary and salt marsh lies to the south of the boat launch and road. The culvert that feeds this area is the subject of restoration interest, with the intent of broadening the salt marsh habitat to its historic extent. Our first -3 tides of the season are today and tomorrow. Excellent mid-day minus tides continue through Sunday. As a bonus, it looks like we’re even in for a few sunny days. I was just out at Harper and noticed those brick piles on the beach but did not realize their historical significance. Thanks, Jeff, for this insight into our past.